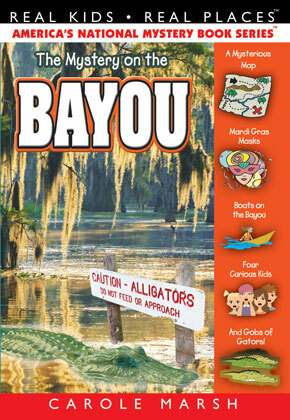 Peachtree City, GA – Gallopade International adds The Mystery on the Bayou to the widely popular series Real Kids! Real Places! by Carole Marsh. This story is the 53rd title in the wonderfully engaging mystery book series, which follow real kids’ adventures through historical landmarks, noted attractions, and the very best monuments that America has to offer. The Mystery on the Bayou follows Avery as she learns that a frightening, legendary creature of the bayou, called a rougarou, is threatening her friends and family. To complicate matters, she discovers an old map mysteriously tucked into her book bag. She suspects that it’s the treasure map of a famous pirate, but who put it in her book bag and why? With the help of her family and friends, Avery pursues clues around the bayou and New Orleans while learning about the culture, history, and natural environment of the area. It soon becomes a race against time as they try to find the treasure before the rougarou finds them! With bewildering clues, a mysterious map, Mardi Gras masks, boats on the bayou, four curious kids, and gobs of gators, young readers are sure to be entertained with this latest addition to the series. As with all Carole Marsh Mysteries, this book contains history, geography, culture, SAT words, educational facts and, of course, fun and humor. Additionally, FREE online activities to go along with The Mystery on the Bayouare available on www.CaroleMarshMysteryClub.com. About Carole Marsh Longmeyer: With more books on Amazon.com than any other author, more than 100 mysteries in print, and endless other fiction, as well as non-fiction titles to her name, this author is a mainstay in school and public libraries, museums, and bookstores. She has a knack for writing stories kids love about place kids want to go as evidenced by her enduring 40-year career. About Gallopade International: For over 37 years, Gallopade has established itself as a premier source for children’s literature and educational content. Products include fiction and non-fiction books, activity books, maps, stickers, coloring books, social studies curriculum apps, and more. Visit www.Gallopade.com to learn more.